ICS Security Market size is set to exceed USD 7 billion by 2024; according to a new research report by Global Market Insights, Inc. The ICS security market growth is attributed to the increasing incidents of cyber-attacks on critical infrastructure industries. Constantly evolving cyber threats, such as ransomware and viruses, can adversely affect production processes in critical infrastructure environments resulting in large-scale financial losses for the companies. The security concerns have increased considerably after the Industry 4.0 revolution as the tendency to connect ICS equipment to the internet has grown significantly in the industries. Also, government and industry initiatives to establish standards and regulations to ensure enhanced ICS security are expected to facilitate a robust growth of the ICS security market over the forecast timeline. 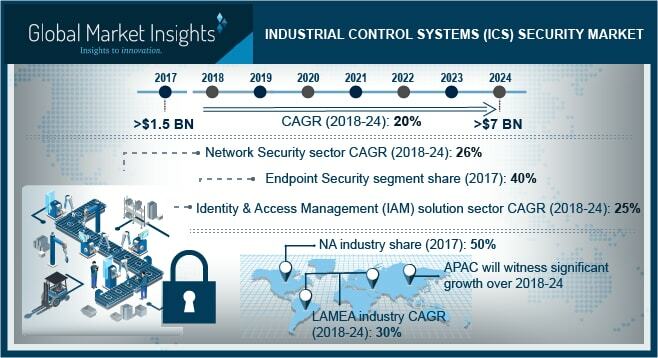 The firewall segment dominated the market in 2017 and is expected to secure a significant share of the overall ICS security market by 2024 due to an extensive adoption of ruggedized firewalls for maintaining and managing network traffic in industrial infrastructure operating in harsh environmental conditions. Firewalls play a critical role in containing internal cyber incidents and blocking external threats that could heavily impact productivity, safety, and reliability. They manage the flow of communication and examine the data packets to ensure blocking of harmful network traffic. Hence, the adoption of firewalls for ICS security is likely to increase consistently over the forecast timeline. North America held around 50% share of the ICS security market in 2017 and is projected to hold a significant share of the overall market between 2018 and 2024. With the availability of extensive industry standards, regulatory guidelines, and government initiatives in the U.S., the adoption of ICS security solutions is expected to grow in a structured manner across different industry verticals such as energy, advanced manufacturing, mining, and transportation. The National Cybersecurity and Communications Integration Center (NCCIC) under the U.S. Department of Homeland Security continuously strives to reduce the risk of cybersecurity challenges to the critical national infrastructure. With the consistent focus on maintaining a secure and robust cyber and communications infrastructure, such government agencies are encouraging the development of deploying advanced ICS security solutions. Companies operating in the ICS security market focus on product innovation and strategic collaborations for securing a competitive advantage. By monitoring and analyzing the number of vulnerable ICS components on a yearly basis, these companies develop appropriate solutions as well as updates to their existing solutions for ensuring effective security against the constantly evolving cyber threats. In February 2018, GE Digital entered into a partnership with NRI Secure Technologies, a cybersecurity firm in the U.S., wherein, NRI Secure was recognized as an accredited certification authority for GE Digital’s Achilles Communications Certification (ACC) program. Through the partnership, GE expanded its global OT network robustness certification program. In February 2017, Rockwell Automation teamed up with industrial security company Claroty to develop its anomaly detection software that is purpose-built for industrial network security. It creates an inventory of network assets and monitors traffic between them to detect and report anomalies. Through such strategic collaborations and partnerships, the companies operating in the ICS security market ensure the delivery of comprehensive security solutions and services to their customers.